Motionctrl.de recently posted a comparison video between the Blackmagic Production Camera 4k and the Red Epic, shot it in Frankfurt, Germany. It’s not quite a fair comparison, as we’re looking at a $3k camera body vs a $40k body, but it’s nice to see them side by side to get a glimpse at the capabilities of each camera. Check out the video below. It’s always hard to compare cameras from a few short clips via web-compressed video, but I think it’s clear that the Epic footage looks noticeably better than the BMPC 4k. There’s a distinct gap in the dynamic range, and the Epic comes much closer to the cinema look that everyone’s striving for with their digital footage these days. There’s also the problem of highlight clipping on the Blackmagic, seen at 1:10 (the little purple dot over the sun). This is something that Blackmagic can hopefully fix with a firmware update soon, though it hasn’t happened yet. Nevertheless, I would say that the BMPC 4k still holds its own against a much more expensive camera body. It’s not an equal comparison to begin with, and the filmmakers note this in the description: “This test is by no means scientific or should prove which camera is better or whatever! The intention was to check, if these cameras will work together as an A and B-Cam setup.” Unfortunately for comparison’s sake, it appears that the filmmakers used different lenses on each camera (noticeable in the lens flaring), and this isn’t even RAW footage from the BMPC- only ProRes. Despite the shortcomings of the comparison, however, the footage from the BMPC 4k still looks great for the price, and could definitely work as a b-cam under tighter budgets. For the best image quality, renting a camera package like the Red Epic is still the way to go. But while the Epic remains one of the high standards for digital cinema, it’s exciting as an independent filmmaker to see better and better images from increasingly cheaper cameras. 12 Mar Professional Video right from your pocket! We utilize a lot of big guns over here at the Studio for our productions. The F5, Epic and C300 are our workhorses and they serve us well but what about the little phones in our pockets? Like many of you (I hope), I’m a fan of the practical and cost-effective. While I still catch myself sometimes thinking about making purchases that I have practically no need for, I never forget that I’ve got such incredible tools at my disposal already. More than enough to tell a story: something heartfelt, a piece that other people can relate to. Exponential improvements in tech is making film making readily accesible to the average consumer/ film maker. Like the recent “1.24.14” video by Apple shot completely on iphones. The 5s with its slow motion capabilities as well as its built in video stabilization add a lot of production value in such a small form factor that it can’t be ignored. You can see the results speak for themselves: As suspected, the 5D’s image quality and color range far surpasses that of the Iphone but the small phone camera makes up for it immensely in a way more viewer friendly fashion. (By that I mean less motion sickness and more down with the sickness) Jokes aside, this may not seem like a lot but if you break it down by cost, the MKiii stands at a price point unreachable for many as it goes for around 3.3k right now. Body only. That means you’re missing a lens, memory card, assorted other accouterments that you need to start shooting. The iphone 5s on the other hand comes in at around 700$ without a contract and is able to shoot video right out of the box @ 1080p and has a slew of apps to edit and “insta” filter it to oblivion . As one anonymous vimeo commenter stated: “theoretically you could take a video from shooting to editing all on your phone”. Not to mention the 5S’ most discerning feature: the abilty to shoot @ 120 fps in 720p. You can see with a bit of color grading and maybe a little bit more planning before shooting, one can achieve quite cinematic results. Now the average Joe can shoot all the action sports, b-roll, behind the scenes he wants, the possible uses are endless. As mentioned earlier, the slew of apps and now even the release of an anamorphic lens for the iphone, continue to solidify the pocket phone as a viable tool in the film maker’s arsenal. Our Rentals Manager Dan Williams just became a Certified Operator for the Tricaster Professional Line this week. He joins just three others in the SF Bay Area on Newtek’s list of certified operators, and is the only one currently certified in the Pro Line (models 410/460/860/8000v2). Dan is available to hire with our Tricaster 460 rental for your next live multi-cam recording or webcast. Call the Studio B Rentals department today (510-848-6026) to rent the Tricaster 460, book a certified operator, and lock down all the crew and gear you might need for your next shoot. The specs and design of the new Arri Amira camera have intrigued us since its announcement last year, but the lingering question on the back of everyone’s mind has been what the starting price will be. Last week Arri announced the base price point for the Alexa’s ENG-Style little sister, which will ship at different tiers of pricing for your choice of configurations. The most basic version of the Amira camera body with a viewfinder will be $40,000. This features Rec709 ProRes 422 HD recording up to 100fps. Above that, the middle level configuration will include LogC, ProRes 422 HQ to 200fps, in-camera grading, and a few more extra features. Lastly the high-end version features 2k resolution at ProRes 4444 and custom 3D LUT controls. The lens mount, battery plate, and shoulder pad will be customizable for each option. The mid-level camera is priced at $45,000 and the highest option is set for $51,500. And perhaps needless to say, these price points only cover the basic essentials, so expect to pay more for other necessary accessories like media, lenses, audio, and camera rigs. When the Amira was first announced, many questioned the lack of 4k recording capabilities. While 4k would help future-proof the camera, the argument against it was that the Amira has a niche purpose as a run-and-gun ENG-style camera, for documentary or news video rather than for cinema. This and its touted 14+ stops of dynamic range, low-light capabilities, and the pedigree that comes from the Alexa’s success helped to change most critic’s minds. The hope, then, was that the Amira would be a bit cheaper and more affordable to independent videographers. It’s too early to know if the $40-50k price range is too high or not, but I think it’s safe to say it is well out of most people’s budgets. Most of the popular digital cinema cameras being used today come in well below that, price-wise, but then again Arri has proved with its previous digital camera models that studios will pay the high price for quality. A breakdown of which cameras were shot on in Oscar-nominated films this year proves that the Alexa is quite popular in Hollywood, though that doesn’t tell the whole story. 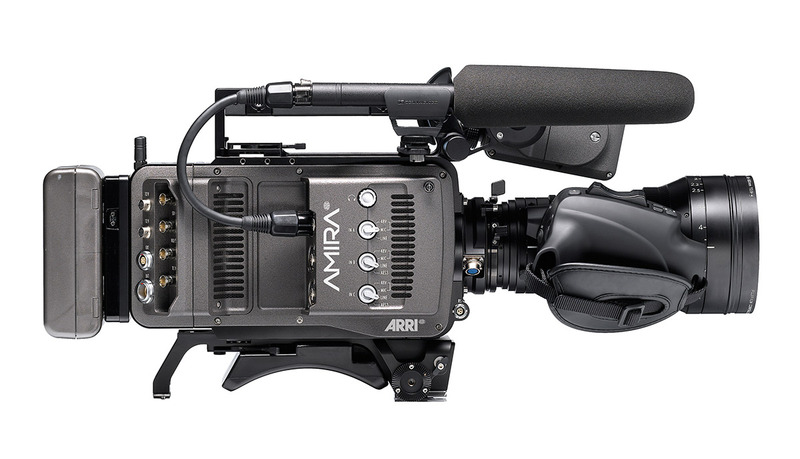 Expected shipping date for the Arri Amira will be after March 2014. It remains to be seen if it will be a popular camera purchase, but there’s no doubt it will be a hot rental item later this year. If there’s one thing to gather from the video products announced at the Consumer Electronics Show last week, it’s that “4k” is more than just a passing fad. All of the major electronics companies seem to be jumping on the bandwagon, with 4k televisions, projectors, and cameras. 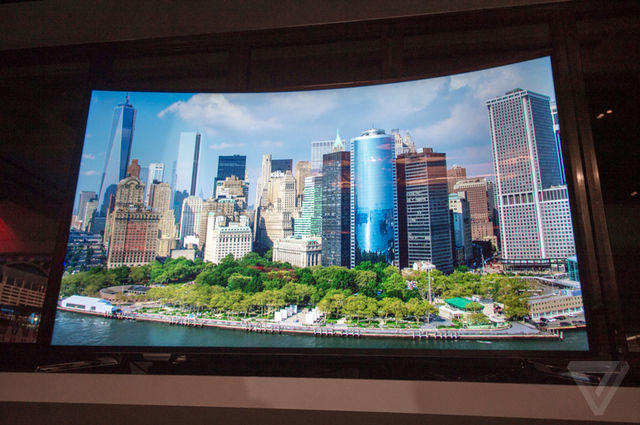 For example, among several other companies’ 4k TV announcements, Samsung unveiled 105″ and 85″ bendable 4k TVs, while Sony showed off their new 4k Ultra Short Throw Projector. Both look like really sleek solutions to one of the main problems with 4k footage: the inability to view it at full-rez on your current TV or computer screen. Now, finally, the monitoring options are catching up to 4k cameras like the Red Epic or Sony F5, (though with 8k cameras already in production, it looks like the resolution arms race won’t stop there). And while camera resolution keeps getting bigger, the size of the cameras themselves keeps shrinking. One of Sony’s big announcements at CES was the FDR-AX100, a handheld consumer 4k camcorder. Although this seems like it could be more of a gimmick to sell cameras based on the “4k” buzzword, the technology is there to where we can get very high quality images from such a small package. The wild popularity of the GoPro line of cameras speaks to this. With such a small form factor and a high quality image (4k even, at low framerates), the GoPros allow for completely unique perspectives in filmmaking– such as affordable aerial cinematography with the DJI Phantom quadcopter. 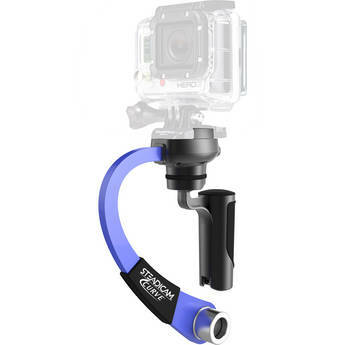 This year at CES we saw new GoPro accessories like the robotic camera operator Jigabot AIMe and the Steadicam Curve, proving that the range of applications for these tiny cameras is getting wider every day. If these trends continue we’ll have cinema-quality 20k footage coming from a pinhole camera within a couple years, but for the time being we’ll gladly stick with 4k, as the sheer volume of recorded data is putting enough stress already on the Studio B servers. Get with the trends and rent a 4k digital cinema camera or GoPro today! As seen from the hypnotizing example above, light placement is everything. Placing a light below an actor’s eye-line for example, can offer an ominous or menacing look (imagine a film noir or a horror film). Conversely, placing a light above an actor’s eye-line provides a more natural and potentially beautiful aesthetic (imagine a high-key comedy or commercial). Whatever the cinematographer’s creative preference might be, as a gaffer, I am often asked to light actors in a portrait setting. Pretty easy right? All that you need for the above lighting plan is three lamps: a key light (one 1K Arri with a Chimera), and two soft backlights (two 2×4 Kino Flos with tungsten bulbs). At the time of the production, I could not quite put my finger on why the setup made the players look so fierce. In retrospect, I realized that the intensity of the portraits came from the way the softback lights accentuated the jawlines of the athletes. As you can see from the example above (using the same lighting setup), we were able to achieve a totally different look, yet maintain a strong jawline on our subject. As mentioned previously, the portrait lighting plan can be modified to taste by adding an additional hard backlight or a fill light. For corporate shoots, I will often bring the key light directly over camera (which provides a nice even spread on the face) and compliment the key with an additional fill light or a piece of reflective beadboard. In conclusion, there is no magic potion or simple formula for lighting every subject. Some portraits are lit with a single source, while others are lit with countless lamps, as Hall said, “the possibilities are infinite.” However, my hope is that the above article and visual examples can help provide a jumping off point for making portrait decisions on your next project. As I my brother and I continue to make films, we have found it crucial to never stop learning and to continually find ways to push yourself both technically and creativity. Informed lighting can lead to fantastic projects, never settle for less. Sony recently pushed out the newest major firmware update for their Sony F5 and F55 cameras. This update includes a few major changes but mostly numerous minor additions to the ever-expanding functionality of the CineAlta line. Both cameras are finally living up to and surpassing the promises Sony teased us with when they were first announced, and proving to be great options for both studio and on-the-go filmmaking. After updating our F5, the new features we’re most excited about are the additional S&Q (slow and quick) framerates for both 2k and 4k recording, the center scan mode for use with 16mm lenses, the activation of the AES/EBU digital audio inputs, and the ability to playback RAW 4k footage from our AXS-R5 recorder on set. Check out the Sony infographic here for a changelog of features throughout the past year. Other notable updates not mentioned in the graphic are additions to the Wi-Fi remote controls, new S-Log color grading space selections and white balance adjustments, and improved user LUT controls. A full list of changes, including both cameras and recorder firmware download links can be found on the Sony forums here. The two features expected in this update that didn’t make the cut are cache recording and interval (timelapse) modes, which have been pushed back to March (firmware v4.0). Besides those, Sony has given us everything promised and more, and the Studio B production team is excited to continue shooting with the improved functionality of the CineAlta cameras. Call or email today to rent our Sony F5 package, fully up-to-date with the new features of firmware v3.0. For those looking at alternative options to Sony’s SXS Pro Plus cards (recommended for best performance on the F5/F55), fortunately as of the October version 2.0 firmware release Sony added support for the Sony XQD memory card format. Not only do the XQD cards outperform traditional Compact Flash cards for image capture, but with read/write speeds of up to 180MB/s they support stable workflows at XAVC 4k Intra 4:2:2 (4096×2160/60p, 600Mbps) and mean super speedy transfer rates to your computer via PCIe interface. A Sony 64GB SXS Pro Plus card will set you back around $850 USD while a 64GB S-Series XQD card costs around $319 for the 180MB/s card and slightly less for the 168MB/s. For the F5 and F55 Sony has indicated that the XQD cards support all codecs: XAVC 4K, XAVC 2K, XAVC HD, HDCAM SR file, MPEG. An SxS to XQD card adapter ($33 USD) is needed to use the XQD card media in the cameras, and an optional USB3.0/2.0 XQD card reader can be purchased for around $38 USD. I tested both the 168MB/s and 180MB/s XQD S-series on the Sony F55 using a resolution, codec and frame rate that would produce the absolute highest maximum data rate which is 600Mbps when recording 4096×2160/60p in XAVC. A quick look at the Sony F5/F55 data chart shows there is no other combination of resolution, codec and frame rate on the F5 or F55 that exceeds 600Mbps. So it would stand to reason that if the S-Series XQD cards can handle 4096×2160/60p that all other combinations of settings should also work flawlessly. If there is still any doubt that these cards have adequate performance to work in various camera shooting modes I suggest that you ignore the codec, frame rate, and resolution, and strictly look at the bitrates you will be working with. For example 4k/60p and 180fps HD in HFR mode have the exact same bit-rate of 600Mbps, which is the highest data rate possible on the cameras. Remember the SR codec maxes out at 440Mbps in 30p mode, and MPEG even lower. When you look at just how fast these cards are in Mbps equivalence, the XQD cards are up and around near 1440Mbps and 1340 for the 180MB/s and 168MB/s respectively, and although the data rates of the cameras don’t come anywhere close to the max rates of the cards, where you will find the benefit in speed is later during transfer of footage when off loading your footage to your computer or storage network device. Unfortunately at the time I performed my tests the N-Series were not available yet so I did not have an opportunity to test them. They should definitely be fine for MPEG on the F5/F55 but from what I read they are more geared for consumer use on the newer generation of Sony 4k cameras. During my testing I also did not have a chance to test 4k XAVC and HD MPEG proxy simultaneous recording on the F55. All and all I think the XQD cards can be a great alternative for the Sony F5 and F55 cameras for personal projects or the budget conscious. Guest blog post by director/cinematographer Dennis Hingsberg. PBS’s POV, which focuses on documentary films, has put together a survey of documentary filmmakers and their favorite gear to use when directing and editing. Although the sample size is relatively small, their answers appear to correlate pretty well with the equipment that documentary filmmakers are most often renting from us here at Studio B. As opposed to studio filmmaking, the documentary approach has always favored the lighter, smaller, and cheaper options for their portability and adaptability within the vérité style. We see this in the survey as Canon comes out on top of the favorite camera brands, due mainly to their line of DSLRs and lenses. Sony, Panasonic, and then Other rounded out the list in that order, and while the Sony EX1 is extremely popular, the Canon C300 took the top spot as most popular camera for doc filmmakers. Canon also took the top brand spot in the lenses category, due partly to the popularity of Canon cameras, and partly to their affordability and versatility. Many other branded cameras are now shipping with EF mount options, or with the ability to adapt to one using a third party mount. The Canon L series zooms provide such a flexible and inexpensive solution to shooting nearly anything, that it is no wonder they are popular with on-the-go filmmakers. Sennheiser and Zoom were the brands at the top of the audio section, which is no surprise due to the industry standard Sennheiser MKH 416 shotgun mic and the Zoom H4n and H6 recorders. We’ve got some exciting new additions to our camera lineup but we’re most excited about the arrival of our new Sony NEX-FS700. While this camera has been out for over a year now, firmware and hardware updates have had time to be released enabling a myriad of new functions to the FS700 including the ability to shoot in 4k Raw @ a continuous 60 fps or 120fps in burst mode. While the FS700 is more widely known for its ability to shoot at a buttery smooth 240fps in 2k, this function only becomes available with an external recorder. This is where the Odyssey Recorder comes in. With its integrated monitor, the 7Q compared to Sony’s own IFR-5 Recorder has the added benefit of shaving off weight and bulk off the rig enabling it to be more compact for whenever the need for a shoulder/ hand held shot arises. While this isn’t the most scientifically accurate size comparison between the two recorders, you can gauge from the photos below just how much of a difference this could potentially make. The body is almost an exact clone of the older FS-100 so anyone familiar with that camera will feel right at home with it’s younger, more able-bodied brother. While the camera stumbles a bit in low light, its ability to shoot continuous 2k footage at 240fps allows the user to do what they can’t on other mid level professional cameras. Another thing to be weary of is the slight bit of aliasing that is introduced while shooting at the highest frame rate. I wouldn’t go as far as saying these are shortcomings: more so tiny nuances that are eclipsed by the camera’s unique features. The built in ND filters and insane frame rate should keep this setup as the go to choice for anyone doing sport/outdoor shooting or anywhere the high fps required/desired. We now have both the FS700 with EF mount for Canon glass and the 7Q External recorder available for rent at Studio B Rentals. Call today to reserve a camera package!